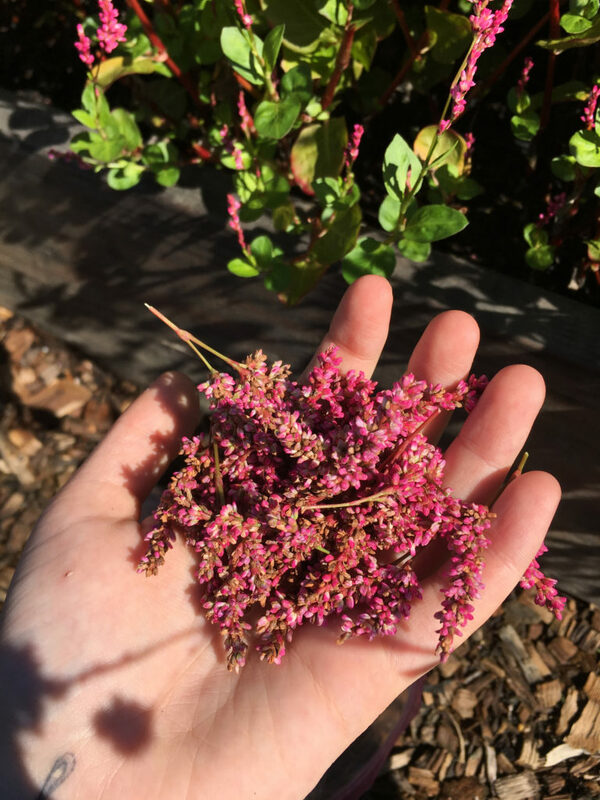 Thanks to the talented Lily Maslanka for these photographs of the most recent fall harvest at the GrowNYC Teaching Garden. Lily has been experimenting successfully with extracting pigment from woad, while I’ve been wholly focused on using the Japanese indigo. Harvesting the indigo in late September, I realize that I’m likely to have less pigment yield, as plants have gone to flower. Once plants flower, they change. I’ve noticed that their leaves are spaced farther apart, and appear somewhat pointier and less wrinkly. It’s amazing watching the seasonal transformations and lifespan of the plant. This plant is a perennial, although I’ve collected many seeds, so it might not self-seed into next year. So many seeds. I am distributing to interested indigo growers in NYC and elsewhere! 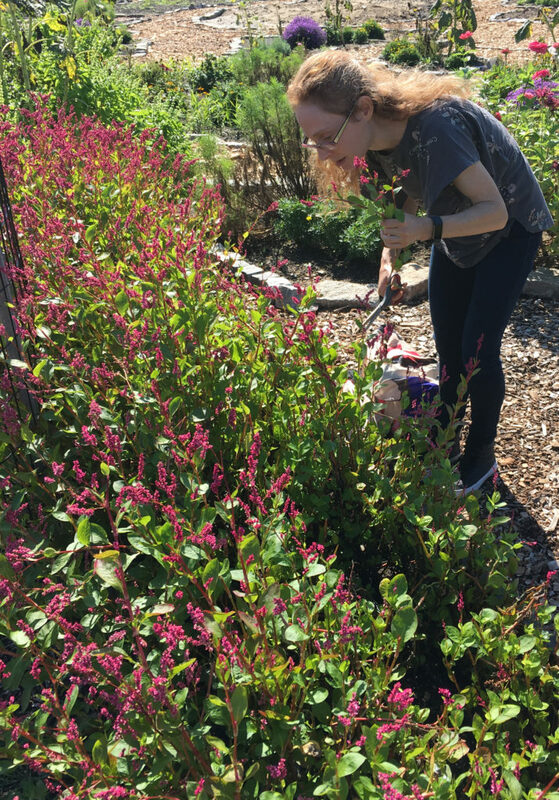 I have thousands — many more than I can plant! Get in touch if interested, please. 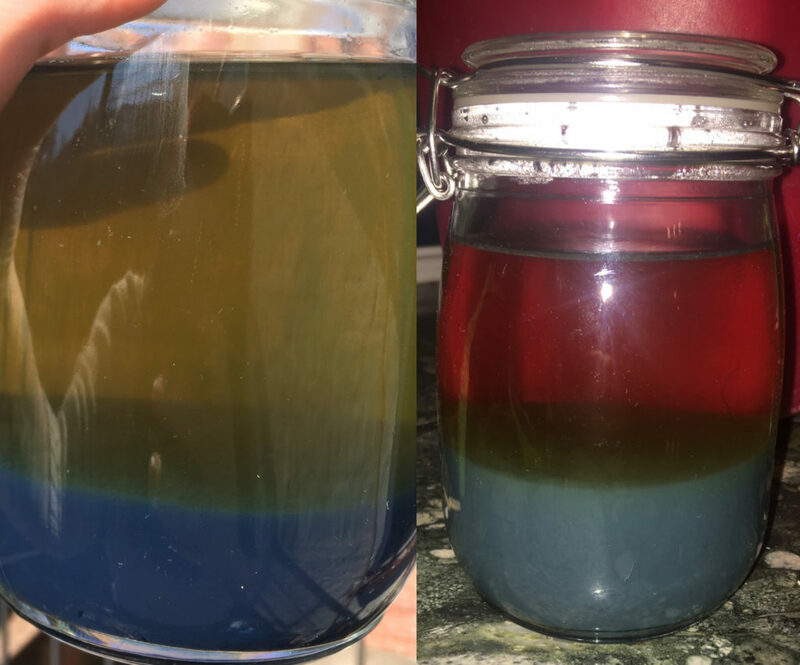 This photo, an accidental success in acquiring new knowledge, taken by Lily Maslanka of her process of extracting pigment from woad, medieval indigo, shows the affect of the amount of alkaline substance added to the fermented leaf bath. After pouring hot water on woad leaves, which were torn a bit into smaller pieces, Lily added 1 tsp of soda ash to the righthand vat and 3 tsps of soda ash to the left…Look how bluer the left is! I had heard that adding more alkalinity could speed up the settling and separation of pigment, but I did not think it would affect the pigment…unless the second harvest after leaves grew back simply contained more pigment?